Have you ever stopped to consider just how dependent your every movement is on those miraculously slippery and cushioned spaces between your bones? Our joints are essential for bodily movement and yet somehow incredibly under-appreciated. Life without joints is hard to imagine; our joints really are crucial to living life as we know it, and caring for them can have a huge impact on how comfortable we feel in our bodies. Do your joints ever talk to you? Are they especially conversant at certain times of year or after specific types of activities? Maybe your joints seem to pipe up at random, or perhaps they’re more persistently vocal. Whatever the case, you will find some useful strategies for supporting your joints below. And even if your joints are wildly happy at the moment, this resource will provide a number of worthwhile tools to help you ensure that they stay that way. In Ayurveda, the bones and joints are considered a site of vata in the body—meaning that they have a general affinity for vata, and are particularly prone to vata imbalances. This reality is only reinforced by the fact that the joints themselves are made up of a lot of empty space—which also corresponds with vata. But the joint spaces are also connected with several different tissues in the body. Obviously, the joints are deeply affected by the quality of the bone tissue (asthi dhatu), but in Ayurveda, the joints also share an important connection with the nervous tissue (majja dhatu), and the nervous system as a whole. In addition, healthy joints are lubricated and cushioned by a fatty substance known in Ayurveda as shleshaka kapha (a subtype of kapha) which links the joints to the health of meda dhatu (the adipose tissue, or fat) as well. What’s more, each of these building blocks relies on the process of tissue nutrition, which brings us to the role of agni (the metabolic fire) in joint health. In Ayurveda, it is said that strong agni and proper digestion are essential to our overall health and longevity, and that every imbalance and disease can generally be traced back to impaired agni and poor digestion. The joints are no different. Healthy joints and all of the tissues that support their physiology rely on tissue nutrition, which is ultimately a reflection of the health of agni. If the concept of agni is new to you, you might appreciate reading The Importance of Healthy Digestion: An Ayurvedic Guide to Understanding Agni, which offers a more thorough introduction, and provides a useful context for understanding the topic of joint health. Most joint imbalances originate in the digestive tract—and more specifically, in the colon.1 Essentially, there are two different scenarios that can lead to imbalances in the joints. The first of them progresses something like this: agni becomes impaired—usually as a result of an excess of vata, pitta, or kapha in the digestive tract. Impaired agni leads to the formation of ama—a toxic, sticky substance immensely disruptive to the physiology. Then vata, which is the most mobile and active of the three doshas carries the ama to the colon, the seat (home) of vata in the body.2 With agni compromised, the ama is able to leave the digestive tract, looking for a weak space to occupy in the body. Each tissue has its own local agni that determines which substances (both nutrients and toxins) are incorporated into the tissue in the first place. Therefore, if agni in the bone and joint tissues is at all compromised, the ama can enter those tissues and create all kinds of disturbances—from inflammation and swelling to deterioration of the joint tissue itself. In this scenario, the solution lies in keeping the central digestive fire balanced and the colon clean in order to prevent the formation of the ama that is disturbing the joints. It is also helpful to bolster the health of the digestive fire throughout the system, so that the local tissue agni in each joint is capable of protecting it from any toxicity that might circulating in the body. The second scenario involves a disturbance in the process of tissue nutrition, which, according to Ayurveda, is a sequential process that begins with nourishing the most superficial tissue, rasa dhatu (the plasma), and progresses, one tissue at a time, to the deepest tissue in the body, shukra dhatu (the reproductive tissue). If there is inadequate nutrition available, it will first affect rasa dhatu (the plasma), but will continue to trickle through each subsequent tissue, with compounding negative effects. In the case of the joints, the nutrition available to several deep tissues (the fat, the bones, and the nervous tissue) is of particular importance, as is the condition of the local agni in each of them. For instance, if there is not enough fat in circulation, or if the local agni is impaired such that there is a shortage of fat nourishing shleshaka kapha, the joints can become dry and will begin to crack and pop. Eventually, the bones and surrounding tissues will also become damaged. Correcting this scenario is a matter of providing adequate and appropriate nutrition and supporting agni throughout the body, so that the nutrients are properly refined and delivered where they are needed. Supporting the joints on a more general level is a matter of clearing any accumulated ama, moving it back to the GI tract, and from there, eliminating it from the body. We also want to reduce inflammation, support proper circulation, and balance agni in the tissues.3 At the same time, kindling agni will ensure that neither excess dosha nor ama are able to find their way back into the joints in the future. The following strategies help to accomplish these goals in support of improved joint health. A periodic cleanse is a terrific way to support the joints because it so specifically kindles agni and clears impurities from the system. As one would expect, the deeper the cleanse, the deeper the impact on specific tissues like the joints. If you are new to the idea of cleansing, please see our Cleansing Department where we explain a number of different cleansing techniques, including a One-Day Digestive Reset, A Simplified Three-Day Cleanse, A Traditional Ayurvedic Cleanse (you choose the length that works for you) and panchakarma. Because an accumulation of ama is so often involved in joint ailments, focusing on Ayurvedic practices that digest and eliminate ama (pachana) can be very helpful. Many of the therapies suggested here do support the elimination of ama. However, you will gain a deeper understanding of how ama forms, how to prevent its accumulation, and how to digest and eliminate it from the body in our resource, Ama: The Antithesis of Agni. The Ayurvedic pharmacopeia includes a number of herbs renowned for their ability to foster joint health. Below are a handful of relevant herbs and formulas. Because so many joint ailments originate in the colon, the joints are deeply supported by efforts to keep the colon clean. There are a number of herbs in the Ayurvedic tradition that are very supportive of colon health and that can help to keep it clear of imbalances, supporting healthy joints. If you do not know which dosha is driving your joint ailments, triphala is the best choice because it is balancing for vata, pitta, and kapha. Triphala is revered for its unique ability to gently cleanse and detoxify the digestive tract (and most specifically, the colon), while replenishing, nourishing, and rejuvenating the tissues. About half an hour before bed, take two Triphala tablets with a glass of warm water. If you prefer a powder, steep ½–1 teaspoon Triphala powder in a cup of freshly boiled water for ten minutes; cool and drink. Or you might try thirty drops of Triphala liquid extract in warm water before bed instead. If on the other hand, you do know which dosha is most involved in your joint condition (see signs and symptoms of vata, pitta, and kapha in the joints, below), you can take whichever ingredient in triphala most directly supports that dosha. For vata, take Haritaki powder or Haritaki tablets. For pitta, take Amalaki powder, Amalaki tablets, or Amalaki liquid extract. For kapha, take Bibhitaki powder. About half an hour before bed, take two tablets with a glass or warm water, thirty drops of liquid extract in warm water, or steep ½–1 teaspoon of the appropriate herbal powder in a cup of freshly boiled water for ten minutes; cool and drink. 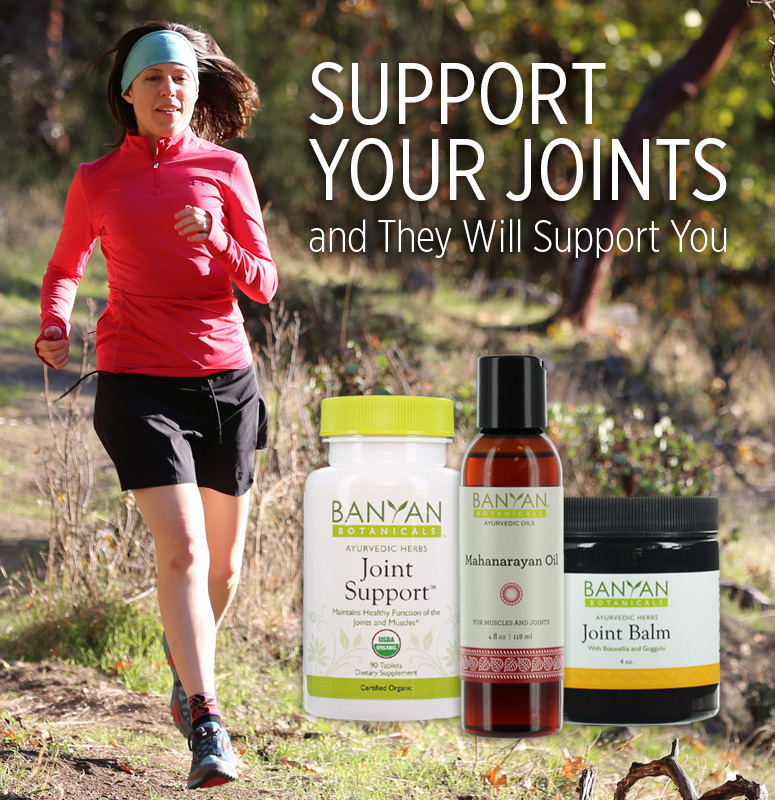 Joint Balm can be applied directly to sore joints. Massaging this balm into the joints helps to increase circulation, facilitates the removal of toxins and ama, and lubricates the joints with supportive oils. The nourishing herbs in this soothing balm offer specific support to the joints and promote the rejuvenation of local tissues. This balm can be used regularly to provide ongoing support wherever you need it. Our Joint Support tablets include penetrating ingredients like guggulu and boswellia, which have been used for hundreds of years to support joint health because of their soothing, lubricating, and detoxifying effect on the joints. This formula also helps to nourish and rejuvenate the bones, cartilage, and muscles that are so critical to the proper functioning of the joints. The joint tissues are closely tied to the bone tissues, so tending to one often affects the other. Our Healthy Bones tablets include a number of warm, nourishing herbs traditionally used to strengthen and rejuvenate the bones, and natural coral calcium, which helps to fortify the bones with essential nutrients. This formula also helps to kindle agni, and supports the body’s natural mechanisms of detoxification. Prana is the vital breath—the subtle essence of the life-force that animates our lives. It infuses every cell and tissue throughout our bodies, and it is carried on and stimulated by the breath. Imbibing prana can be very helpful in digesting and eliminating ama from tissues throughout the body.4 There are a number of effective ways to bathe our tissues in fresh prana. The simplest method is to spend some time in nature and either take several deep, slow breaths into the belly, or go for a relaxed, enjoyable hike. 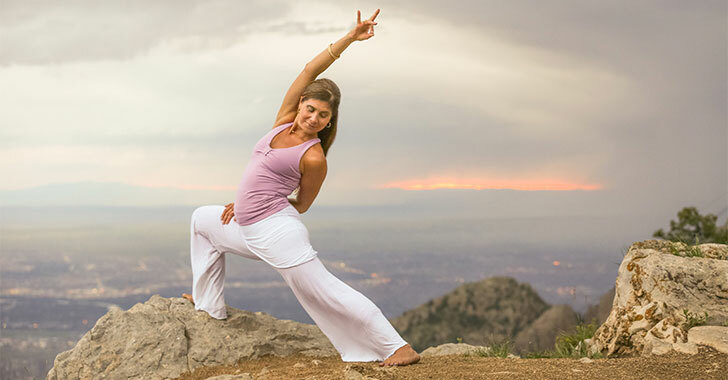 Pranayama (yogic breathing exercises)—either indoors or out of doors (as long as it is not excessively windy)—is another powerful way to infuse the mind-body organism with prana. Specific pranayama practices are included in the remedy guides to vata, pitta, and kapha types of joint imbalances. 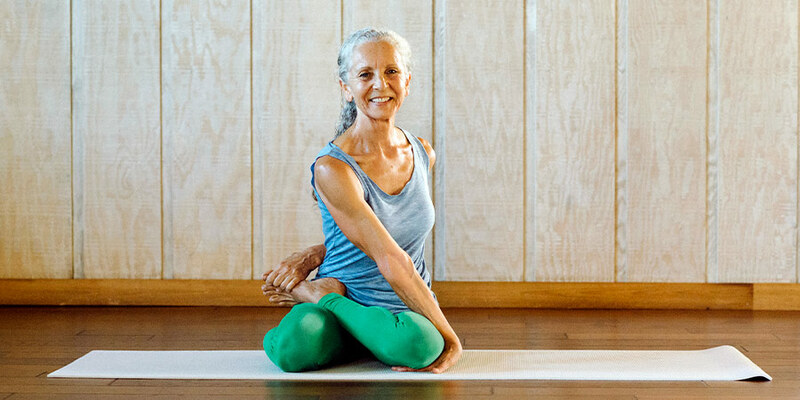 Beginning practices that are appropriate for most anyone include Full Yogic Breath, Ujjayi (Breath of Victory), and Nadi Shodhana (Alternate Nostril Breathing). We can also help to preserve and protect the joints with the following supportive practices. Practicing a series of gentle joint rotations daily helps to lubricate and protect the joints. In fact, it is often recommended as part of an Ayurvedic daily routine, and it only takes a few minutes. Consider doing about ten rotations in each direction for each joint. Start with the arms, rotating the wrists slowly in each direction. Next, place both hands on your shoulders (right hand to right shoulder, left hand to left shoulder) and draw circles around the shoulder joint with the elbows—first rotating backward, and then forward. Then, let your arms hang long and circle the shoulders themselves, first backward, and then forward. If you are comfortable doing slow, gentle circles with your neck, you can do a few in each direction before you shift your attention to the legs. Begin there with the ankles. Fold one ankle over the opposite knee and use one hand to gently turn your foot in circles around the ankle joint—first one direction and then the other. Then stand up, bend your knees, place your hands on your thighs (just above the knees) and make circles with your knees in both directions. Now separate your feet, place your hands on your hips and make wide circles with your hips—first clockwise, then counter clockwise. These practices are very effective at increasing circulation in the joints and supporting proper lubrication. If the entire practice is too much, you can focus where you need the most support, or reduce the number of repetitions for one or all of the joints. If your hands or feet need a little extra attention, you can massage the knuckles on the fingers and toes with gentle, circular motions—one at a time. Our joints are meant to move. In fact, proper movement encourages their overall health. But, some activities are far from supportive. The type of movement that is right for you will depend on your constitution, your current state of balance, and any other special considerations you may have (injuries, vulnerabilities, stage of life, etc.).  In general however, the joints are supported by low-impact activities. There are more specific recommendations for exercise in the links below. Yoga and gentle stretching can help to improve circulation in and around the joints. Yoga also nourishes our bodies with prana. Cat-Cow (Marjaryasana Bitilasana) (especially if it is done as described in this link, with an organic wave-type motion) is wonderful for clearing and lubricating the vertebral joints along the spinal column. There are more specific ideas for yoga practice in the links below. Because tissue nutrition determines the health of the joints, a balanced diet is critical. In particular, make sure you are getting an appropriate amount of high-quality fats and that you are actively tending to agni. Different constitutions and imbalances require different amounts of fat and different types of foods. You will find more specific dietary recommendations in the links below. 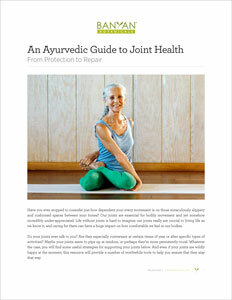 As we have seen, there are any number of general ways to support the joint tissues. However, Ayurveda also identifies three more specific causes of joint imbalances—each one associated with either vata, pitta, or kapha. Knowing which dosha is primarily behind our joint ailments can help us to implement more effective treatment strategies. When excess vata enters the joints, the joints become dry (but not usually swollen), they tend to crack and pop with movement, and they can be cold to the touch.5 Vata-type joint pain is usually triggered by movement, and it often involves specific point tenderness. Osteoarthritis and Rheumatoid arthritis are both examples of excess vata in the joints. While the symptoms of Rheumatoid arthritis can mimic pitta-type joint symptoms, the inflammation is not actually caused by pitta at all, but by ama entering the joints. If any of these symptoms sound familiar, please see our resource on Balancing Vata in the Joints. Excess pitta in the joints is characterized primarily by inflammation and swelling; the joints are often hot to the touch, and visibly red.6 Joint pain can be more persistently present, frequently even without any aggravating movement.7 If any of these symptoms seem to match your own, please see our resource on Balancing Pitta in the Joints. Excess kapha in the joints tends to cause stiffness and swelling, but rather than being inflamed and hot (as with pitta imbalances), kapha leaves the joints feeling cold and clammy to the touch.8 When kapha is involved, pain and stiffness are often more pronounced in the morning, and tend to be relieved as the joints and muscles warm up and move around.9 In fact, appropriate movement is actually one of the best forms of relief for this type of joint disturbance. If these symptoms seem to best reflect your situation, please see our resource on Balancing Kapha in the Joints. Remember, Ayurveda is a very individualized approach to health and healing. Not only are we each completely unique, but Ayurveda aims to meet each of us exactly where we are. Therefore, it is important to honor your own process and your own sense of timing. If the condition of your joints is interfering with your quality of life, you may be highly motivated to address the root cause of your imbalances as quickly as possible. If your joints are not actively troubled, but you want to protect them long into the future, you may choose a more measured, gradual approach to change. Trust that whatever works for you is right for you. Keep in mind that working with an Ayurvedic practitioner can help you to tailor your strategies to more directly support your particular situation. Whatever your path, we hope that we can continue to support you in cultivating and celebrating a deep sense of comfort in your body (including those miraculous joint spaces), as well as vibrant overall health. If you are still hungry for more, the following resources more specifically address the Ayurvedic perspective on agni, digestion, elimination, and ama—all key factors in joint health. The Importance of Healthy Digestion explores agni’s role in maintaining health and vitality throughout the body and offers practical tools for kindling the sacred fire within. As discomfort in the joints is often the result of a broader imbalance with agni, this resource is actually quite relevant to joint health. The Importance of Agni explores the specific functions of agni, as well as the signs and symptoms of both healthy and impaired agni. The Four Varieties of Agni compares balanced agni to the different types of imbalances that can disrupt it and offers appropriate therapies for each type of imbalance. Ama: The Antithesis of Agni introduces us to the toxic, undigested material called ama whose qualities directly oppose those of agni. Ama in the body can either be the cause or the result of impaired agni—and in either case, threatens our health on many levels. Ama is often a critical factor in joint imbalances. Ayurvedic Guide to Healthy Elimination provides a more comprehensive look at healthy elimination. Because joint imbalances tend to originate in the colon, understanding elimination through the lens of Ayurveda can be very helpful. This resource defines healthy elimination and teaches us to identify the various forms of imbalance that can disturb the channels of elimination, offering therapeutic strategies for each type of imbalance. Pitta-type joint ailments are initiated by excess pitta in the body. The imbalance typically begins in the digestive tract, where pitta has accumulated as a result of a pitta-provoking diet or lifestyle. This might involve eating foods that are very spicy, sour, salty, or excessively oily. Pitta is also aggravated by heightened intellectual focus, ambition, competition, judgment, and intense exercise. Kapha-type joint ailments are initiated by excess kapha in the body. The imbalance typically begins in the digestive tract, where kapha has accumulated as a result of a kapha-provoking diet or lifestyle. This might involve eating foods that are heavy, oily, dense, or excessively sweet. Kapha is also aggravated by inactivity, dullness, boredom, lethargy, and inadequate exercise. 1 Vasant Lad, The Complete Book of Ayurvedic Home Remedies (New York: Three Rivers Press, 1998), 129. 3 Sebastian Pole, Ayurvedic Medicine: The Principles of Traditional Practice (London: Churchill Livingston, 2006), 335. 5 Lad, Home Remedies, 128. 8 Lad, Home Remedies, 129.